Animals have complex personalities. Some seem almost human. Those of us who love dogs and cats know this, but wild creatures are a different story. They live in worlds apart from us, so we underestimate their intelligence, intuition and altruism. They’re not simple beings. They’re as varied as we are. In another blog, we describe introverted (I) animals: the owl, sloth, deer, octopus, wolf, beaver, meerkat, and house cat. Here we describe the more sociable species, the extraverted (E) animals: the fox, lion, otter, dolphin, honeybee, parrot, elephant, and dog. Like most ESTPs, foxes look for pleasure in life and want to share it with others. ESTPs are charismatic and dramatic. They’re spontaneous and fun to watch. They know how to influence those around them. 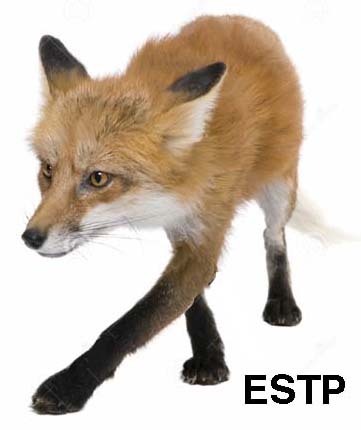 In this respect, foxes are like their ESTP human counterparts. If you’re looking for a good time, foxes will quickly endear themselves to you. They’re also quick-witted and can be tricky. The jury is still out on foxes as pets. Farmers who keep chickens don’t have much good to say about foxes because they raid henhouses. However, some fox breeds have been domesticated to live with people. Families who adopt them say they’re as much fun as dogs and cats but more trouble. They must be kept in secure outdoor enclosures when not watched as they’re escape artists. Because of their high energy, owners need to provide them with tunnels, balls and chew toys. Left free to roam in the house, they make a mess. Also, they’re expensive to keep, considering vet bills alone. 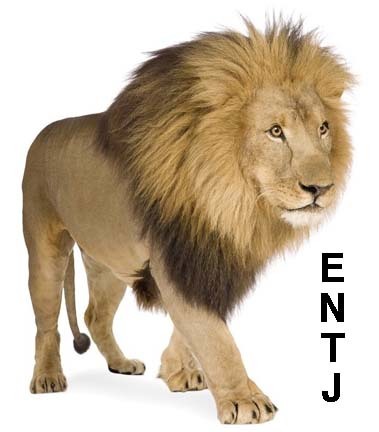 As ENTJs, lions are independent, logical thinkers. 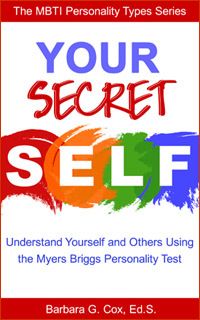 They live in packs called “prides.” Because they’re thinking (T) types, they don’t let emotions enter their decision-making process. That’s why they’re often seen as callous. But these fierce cats can be warm and nurturing with members of their group. They’re caring parents, protective of their cubs and relatives. At the same time, they’re enterprising and powerful. Just like ENTJ people. The stories of lions as pets almost always have a bad ending. While lions are cute and cuddly as kittens, they have another 15 years of life to live as wild animals. Nothing can change their instinctive nature. There’s a good reason people don’t keep big cats in their homes. Families lose their homeowner’s insurance, their neighbors hate them, and they get frequent visits from the police, not to mention federal and state wildlife officers. And then there’s the expense of feeding them. Lions need to eat about 10 pounds of raw meat daily at least five days a week. 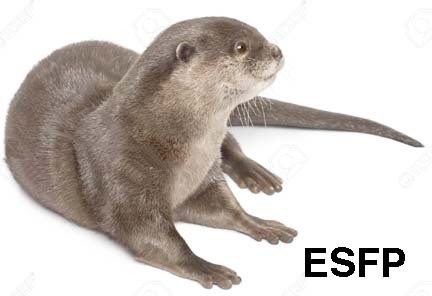 As ESFPs, otters revel in the moment. They live at top speed. They’re playful, generous with others of their species, and always see the bright side of life. They love having new adventures with their friends. Learning things in a routine way is not their thing. They like to experiment. They’re intelligent and creative. The object of life is to have a good time and eat well, lying on their backs cracking open shellfish or zooming around underwater looking for fish. Do otters make good pets? It’s almost impossible to own an otter safely and keep it happy unless you own a lake. If otters are taken in the house, they produce a strong smell. They can spray like a skunk. Some bite when they’re displeased. They have sharp claws and teeth. Plus, they eat several pounds of seafood a day, which could put quite a dent in a grocery budget. Dolphins are so sociable that they make friends not only with their own kind but with other species such as humans. They’re keenly aware of the feelings and needs of those around them. They aim to please. Like most ENFPs, dolphins enjoy company and are seldom out on their own. They have boundless energy and enthusiasm. It’s not unusual for beach-goers to see groups of them playing offshore, performing in the water like synchronized swimmers. 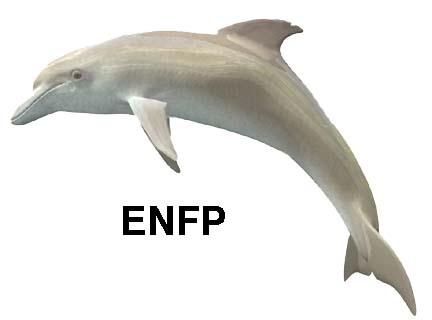 ENFPs, including dolphins, get bored easily and are always ready for new adventures. Dolphins are not pets. 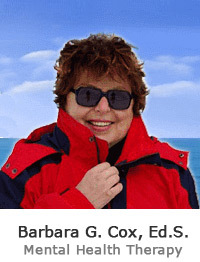 Many people even question the ethics of keeping them in water parks. The capture of dolphins in the sea is a violent event and causes the families of these intelligent water mammals much pain—not unlike that felt by human families that have had a child kidnapped. Kids and adults who watch them perform are usually delighted. Animal welfare people take a different view. 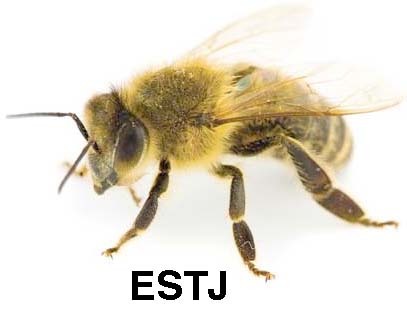 ESTJ honeybees are civic-minded creatures that try to improve their society, organize their environment, and make improvements. They’re perfect counterparts to ESTJ humans. They’re good at making their needs and desires known. As strong believers in the letter of the law, they follow rules and regulations. No-nonsense bees are practical and direct and have little use for new experiences. Bees live in a complex, cooperative society. Needless to say, there’s no such thing as a pet bee. However, humans have kept bee colonies since the Paleolithic Age, as shown in cave drawings. While many people keep bees for their honey, others use them to pollinate trees and plants. In recent years, urban bee-keeping has become popular. Families feed the bees by planting flowers that provide nectar and pollen. Just as ESTJ humans are “busy bees,” these tiny animals perform many chores: cleaning, making wax, repairing their hive, and feeding their young. ENTPs value intelligence and skill over all other things. They’re often described as witty, bright and resourceful. 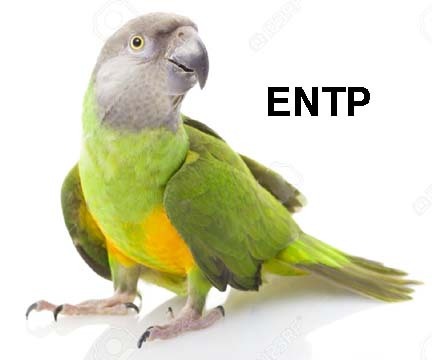 Parrots, the perfect ENTPs, can speak, hold conversations with their human owners, and even make jokes. They like to analyze every side of things and are creative thinkers and workers. They take pleasure in the company of others. ENTPs enjoy a constant flow of inspiration and jump from one challenge to another. While parrots are hard to resist as pets because of their beauty and intelligence, owners often get more than they bargained for. The screeching and chattering can get tiresome. Parrots are cute when young but demanding when they reach adulthood. And they’re a long-term commitment, as they can live to be fifty years old. The exceptional minds of these birds make them both a joy and a challenge. Some talk and behave at the level of a three-year-old child. Parrots need an enormous amount of attention and care, more than most people can provide. Like their human ESFJ counterparts, elephants are genuine and authentic. They care deeply for each other. 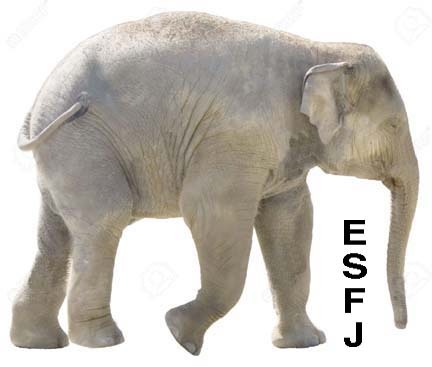 ESFJ elephants bring out the best in those around them. They’re loyal and responsible to their families and members of their herd.They are tolerant of the faults of others. However, they’re also sensitive and their feelings are easily hurt. Elephants are among the world’s most intelligent animals. They have larger brains than humans. They are highly compassionate and kind, even coming to the aid of other species—including humans. Because of the high intelligence and strong family ties of elephants, many believe that it’s morally wrong for humans to capture them and use them for entertainment, work or other purposes. Howeve, few people even think about getting a pet elephant. Those who do are signing up for enormous responsibility and expense. Elephants eat over 400 pounds of fodder and other foods per day. 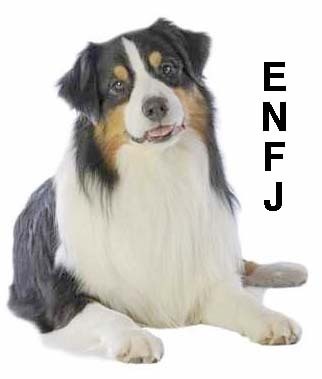 Like ENFJ people, dogs like to have a wide variety of friends. Dogs who are confined alone often become depressed and irritable. Dogs are cheerleaders and love to greet their families with a face lick and wagging tail. They feel good when those around them feel good.They are the picture of loyalty, which they give freely and accept joyfully. Usually, they adapt to new groups easily, as can be witnessed at any dog park. They are truly team players. Dogs, all descended from the grey wolf thousands of years ago, come in a variety of shapes and sizes. Over 300 breeds of dogs are now recognized, ranging in size from the tiny Chihuahua to the huge Great Dane and St. Bernard. More than any other animal, dogs understand humans and bond with them. They learn easily. They’re hard workers, too, rounding up sheep and cows, doing police work, and even guiding the blind and disabled. Many families feel their homes wouldn’t be complete without a dog.